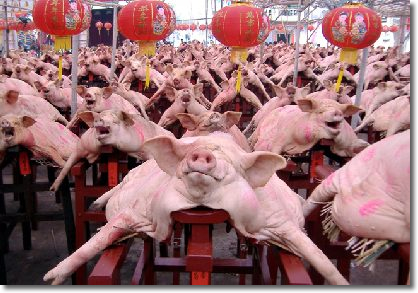 Guanlong, Denghai [in Guangdong province] has the custom of an annual “Great Pig Contest.” This contest is a folk ceremony for celebrating an abundant year, similar to praying for a bumper harvest and prosperity. But the spectacle and grandeur of this ceremony is rarely seen in these parts, and in addition the Great Pig Contest promotes growth. 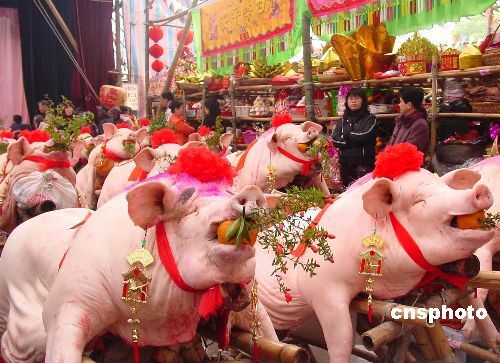 On the 18th day of the first month of the lunar calendar, the site of Denghai’s Great Pig Contest is quite a spectacle. All one can see is over 500 flayed-open fat pigs, each spread on a wooden frame about 1 meter in height. Looking in that direction, one sees a field of snow white. These porcine offerings have their heads held high and their mouths stuffed with tangerines. They look as if they’re leaping forward, presenting a scene of vigor and high spirits. Attached to each wooden frame is a red label reading, ” so-and-so fortune and respect” so that each family can identify its own offering. People are milling about, each wanting to be submerged in the center of the crowd, and only bits and pieces can be seen of even the tallest. Shouts echo through the crowd as people try to locate one another. Every year the largest pig is put forth in the front row with its weight displayed. They’re generally about 1000 jin or more. In addition to labeling it with the family name, the biggest ones were also wearing big red flowers! These huge pigs have all been raised since last spring. There’s a very rigorous process for keeping them fat and healthy. It’s said that every year the Great Pig Contest takes place on the 17th and 18th of the first lunar month, and that it’s organized on a rotating basis by different family lineages. And as it’s at the beginning of the year, this kind of contest can not only enliven the farmers’ enthusiasm for production and fill the new year with hope, it also increases the atmosphere of joyous celebration. So lively! My spouse’s family does this too, we call it “Displaying Pigs and Sheep,” sometime around the new year. It’s a shame I’ve been unable to see it for many years! May I ask, what do they do with all the pigs after the contest? If the weather’s a bit hot, wouldn’t the pig flesh start to stink? Is it interesting? It makes me feel I’ve entered a slaughterhouse. What a strange folk custom! It’s really a problem, what to do with all that pork. Hey Everyone, I’m a bit of a newb here, but I wanted to introduce myself to the forum. My name is Rob. I hope to be around for a bit. Talk to you all soon! Previous post HipiHi = Chinese Second Life?